OC Mom Activities: Moshi Monsters at the LA Zoo? Recently we attended a fantastic event up at the LA Zoo to showcase and introduce a few bloggers to the World of the Moshi Monsters. My boys got the chance to explore and play around with the Moshi Monster who resides in Monstro City online world while I asked some questions about how it all works. Moshi Monsters can be adopted (for free) on the website, but you can upgrade your membership for a small cost and that allows you additional features. Your Moshi Monster needs food & entertainment. 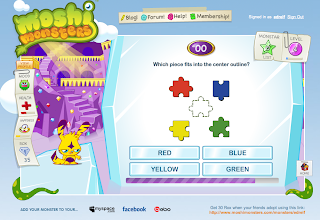 To gain Rox (money in the Moshi World) you need to complete online challenges and puzzles. You are only allowed to do each puzzle/challenge once a day to discourage children from playing all day long on the site. Moshi Monsters.com is 100% monitored by a diligent (yes, I met one of them!) team of people to ensure there is no inappropriate creation of monster names, or posting of personal information on the message board. If you name your monster something inappropriate... I hear it will get changed to something over the top cutesy. Parents you will need to help your children set up their Moshi Monster account and I highly recommend having the emails sent to your account. Then you are able to monitor everything that comes in (but honestly, my sons have been exploring the site for several weeks on their own and I have yet to see any other emails than the set-up ones because my boys don't go on the message boards). Your children's contact information is completely hidden to any other children on the site. One thing that is clear to me is that the team behind the scenes is as passionate as making it a safe social networking site for children as it can be. 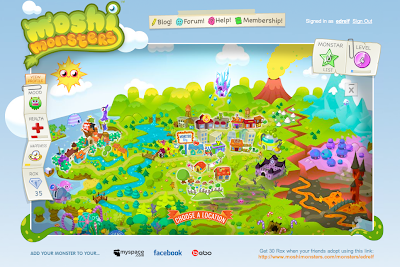 Moshi Monsters.com is great for children ages 6 and up, depending on how computer savvy they are. Both my boys adore the site and are eager to log in and "level-up" the allotted once a day. "Moshi Monsters are cool because at the new market place has clothes get them and you will be able to dress up your monster. I like gift Island because you can send gifts to other monsters. And I like the post because you get to shake rox trees and color your monster. And I also like the underground disco. And the Entire Moshi Monster Island too!" * Information was provided to us at the event and I received 1 month upgrades to VIP on the Moshi Monster site plus other small themed goodies, but even without those, my sons were requesting to upgrade and we will be renewing those on our own dime because the boys enjoy the site so much!